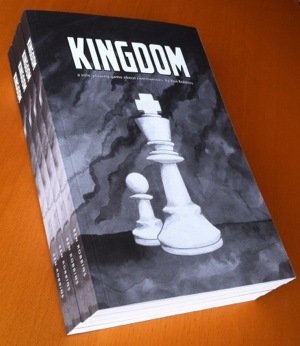 Kingdom books are now on sale. Go get you one. You’ll notice that you can order Microscope books too. Now that I’ve jumped into the deep end and set up the infrastructure to ship piles of books for Kickstarter, I’m going to give direct sales a try. Books and PDFs will still be available at other stores as well (well, Kingdom will be as soon as I get around to setting that all up) but you can also get them here, straight from the source. I’d like to see Microscope and Kingdom on the shelves of more Friendly Local Game Stores, but right now IPR is the only distributor carrying them. The system is backwards of what you might think: distributors only want books if game stores have already asked for them. So if you want to see Kingdom and Microscope in your game stores, you need to ask the stores to carry them. Then the game store owner asks the distributor, the distributor sees demand and decides to carry the books. And then everybody gets to play, which is the whole point. Not at the moment. PayPal should take credit cards, but the unknown trumps the known.